The modern community of Shilo spreads up the hills overlooking Tel Shilo, where over 3,000 years ago the children of Israel gathered to erect the Tabernacle and to divide by lot the Land of Israel into tribal portions. Shilo today is made up of over 200 families, of all ages and all backgrounds. The criterion for living in Shilo is the desire to live in a modern religious Jewish environment and assume the responsibilities of a pioneering society. The variety of people in Shilo is a direct reflection of the diversity of the people who have returned to the Land of Israel in order to recreate a Jewish State. Driving straight north from Jerusalem you arrive in Shilo within half an hour. About an hour from Tel Aviv, due east. The biggest secret about the communities, and in this Shilo is strong, but not unique, is that they are a place where one can get a taste of what Israel once was from border to border- an intimate supportive community. It's not like moving from a city in the Diaspora to a city in Israel. It's to find oneself surrounded by an entire community which is concerned about you, about each other, and about creating a better future. Shilo is long on facilities. There are two health clinics (Kupat Holim Leumi and Clali), a local Doctor (her name is Ofra), a dental clinic, occupational therapy facility, and an ambulance for emergencies. A grocery store and a vegetable vendor, post office, library, three industrial areas, a hat and clothing store, and a cemetery. For entertainment, Shilo has a pool (1/2 day men, 1/2 day women, the next day reversed), and an outdoor sports complex including tennis, handball, basketball, and soccer. There are five synagogues in Shilo, mikvas for men and women, and Rav Elhanan Bin Nun, the rabbi of Shilo for questions, classes, and many kinds of support. Rav Elchanan has been involved with shaping the school and the direction education has taken in Shilo almost since its inception. There are more childcare and daycare facilities here than one can count. Starting at just a few months old, a child, or their parents, have the choice of small or large, home-based or public arrangements to care for thier children for part or full days. Shilo is the center of the "Shilo bloc," which means that the school for the four surrounding communities (elementary through junior high school) is here. Shilo is the home of a successful Hesder Yeshiva, with close to two hundred students, under the auspices of the Army, the government, and Rosh Yeshiva Rav Michael Brum. The Yeshiva contributes in many ways to Shilo, including offering private (hevruta) and public (shiurim) study opportunities, and contributing a healthy number of long-term residents to Shilo from amongst its graduates and teaching staff. This upcoming year  a new yeshiva high school is opening in Shilo named "Bnei Bina." It will be headed by Rav Bentzi Amar, and they plan eventually to move the school east towards Shvut Rachel. In the meantime, the school will be in the Hesder yeshiva campus. A large number of Shilo residents teach in one of the educational frameworks in Shilo, the surrounding arieas, or Jerusalem , Tel Aviv area, and even Beer Sheva. From cheder teachers to professor at Bar-Ilan, from English to computers, Shilo is an environment of teaching and learning. Shilo has also shone in the aliya department. It boasts representatives from most every country Jews have left to come to Israel. In the massive wave of Russian immigrations several years ago, Shilo opened its gates, and a number of those who found a first home here have chosen to stay on. North America, Northern Africa, Europe, and South America are also counted amongst Shilo homeowners. The aliya from outside the country and the influx of people from the Yeshiva maintains a balance of styles and views which reflects the development of Am Yisrael, and seems to be healthy for all. 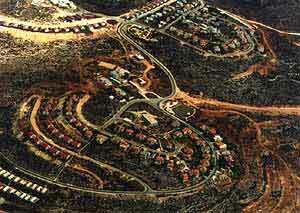 Yehuda and Shomron (Yesha) is very attractive to new immigrants from all over the world for a variety of reasons. The close-knit relationships prevalent in Yesha's rural communities are a partial compensation for the parents or children or other family members that many olim left behind in the "old country." The beautiful physical surroundings and the reasonable prices of housing are also advantageous. Often new olim many have many things they have to adjust to in Israel. For those who want to make Yesha their "first home in Israel" there are a couple of ready-made options which are similar to "mercaz klita" but are sponsored by the local communiites and regional councils rather than the Jewish Agency of the Israeli government. For those who wonder about the efficiency of large bureaucracies, this is sometimes a preferable solution. The advantages often far outweigh the disadvantages.